I’ve been seeing this story about a ‘school’ who canceled a reading of Jazz Jennings book in my social media feeds. I finally decided to read one and just wow. The narrative was so thick you need a machete to cut through it. Jazz Jennings has responded to a Wisconsin school’s cancellation of a reading of her book I Am Jazz via a column in Milwaukee’s Journal Sentinel, thanking the school’s principal for her intentions and expressing sadness that a small group of parents caused the cancellation. The children’s book coauthored by the transgender teen was to be read to students November 23 at Mount Horeb Primary Center, located in the town of Mount Horeb, near Madison. The school had sent a letter to parents November 19, letting them know about the reading and saying it was a way to foster respect and support for young transgender people. Some parents, however, enlisted the support of Liberty Counsel, a right-wing legal group, which threatened a lawsuit if the reading was not canceled. It claimed that the reading would result in “confusing many children,” “undermining modesty,” and “promoting non-factual, radical, and controversial assumptions about ‘gender.’” Liberty Counsel, which is also the group defending antigay Kentucky county clerk Kim Davis, is classified as a hate group by the Southern Poverty Law Center. The Advocate article also links to Jenning’s “eloquent column“. I read that too. Let me summarize Jazz Jennings “eloquent column”: How dare those parents actually parent. Ok, back to the Advocate column. This is a teachable moment in media bias, people, so let’s get our Political Correctness media checklist out. 1. Does the article marginalize a group of people objecting to the social issue in the opening paragraphs? CHECK. The author marginalizes and neutralizes the parents who are upset by citing Jennings letter, who calls them a “small group”. Well, there you have it! It’s just a few ‘haters’ right, Jazz? Who cares that they happen to be parents and have rights, eh? It’s more important that ONE girl at Mt. Horeb Primary ‘be understood’, right? Their rights end where your feelings begin, right? Wink wink, nudge nudge. That’s right. It was one girl’s feelings are why an inappropriate topic book was being read to little kids at this elementary school. The needs of the few outweighing the needs of the many is the new pattern. 2. Does the article fail to highlight key elements of the story that would change the desired narrative while throwing in one factual item to make them sound ‘balanced’? CHECK. Note that the article names the school, Mt. Horeb Primary Center, but doesn’t really elaborate on the school much. That’s because Mt. Horeb is an elementary school and this book is without argument inappropriate reading material. But the author knows readers might react that way, so they include the tidbit that there was only a 2 day window of parental notification prior to the scheduled reading. See what the author did there? They gave readers the permission to question the time frame for notification instead of focusing on the actual book itself. 3. Does the article glaring make it’s agenda clear by smearing the objecting parties via name calling or shaming? CHECK. Oh yeah, this article has the agenda in flashing neon from start to finish. The last paragraph I cited in excerpt above is case study in narrative manipulation. See, in that third paragraph, the author has just shifted the reader back on track. Now it’s not that two-day notification period or even the book that is worrisome, it’s the parents and their lawyers who are worrisome and are the problem. The author makes sure the reader knows that these parents and the groups defending them are ‘haters’! Why are they haters? Because the Southern Poverty Law Center says so. The same Southern Poverty Law Center whose “hate map” inspired Floyd Lee Corkins to attempt mass murder at the Family Research Council. The same Southern Poverty Law Center who called parents who oppose Common Core “extremists“. No, I am not kidding. GEE, now why would parents think that? It’s not like an elementary school just tried to push a sexual orientation book on little kids or anything. Keep reading the ironic punchline is coming. The same Southern Poverty Law Center who has an education offshoot called “Teaching Tolerance”. I wrote a five-part series on them earlier this year. The entire point of Teaching Tolerance is to indoctrinate kids with far Left agendas and turn them into social justice warriors. 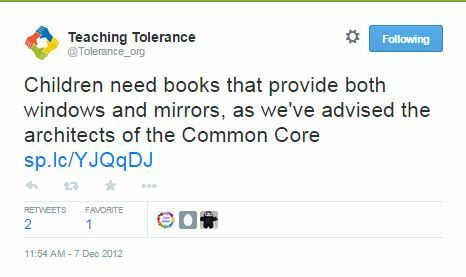 Teaching Tolerance recently announced their ‘free curriculum’ was now “Common Core aligned” and employs “anti-bias social justice content“. Apparently ‘whip/naenae‘ is Teaching Tolerance’s idea of good curriculum. Bottom Line: Your child will be made to care. This entry was posted in Common Core, EDUCATION, LGBT, LL1885, Media Bias, Narratives, Poltical Correctness, Racial Justice, Social Justice, The Articles and tagged Jazz Jennings, Southern Poverty Law Center, SPLS, Teaching Tolerance, Transgender. Bookmark the permalink.